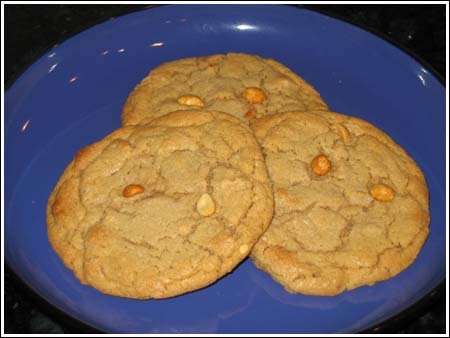 From a Texas Montly Magazine on-line forum, this recipe makes huge peanut butter cookies. In large bowl, combine sugars, butter, peanut butter, vanilla and egg; beat well. Lightly spoon flour into measuring cup and level off. Stir together flour, baking powder, baking soda and salt; Add to batter and mix well. Bake in a preheated 375 degrees F; for 13-16 minutes. Remove from cookie sheet and cool completely on wire rack. I made a batch of these cookies today and they were fabulous! Thanks so much for sharing the recipe. I was too impatient to wait for the dough to chill so I baked 4 right away and they turned out great. I then chilled the dough and had the same problem that I always seem to have when I bake chilled dough – the bottoms got really dark. Any idea why that happens and how to prevent it? I used a silicone baking mat on my cookie sheet – not sure if that would impact it? Val, I sent you this link this morning. There’s an institutional size version and a scaled down version of school cafeteria peanut butter cookies. The school cafeteria version on the link is different. It uses shortening, milk and different proportions. I made the PB cookies yesterday and they are really good. great PB taste and nice texture. to answer the question above, no, they aren’t chewy. as anna said, they are tender, which to me is sort of the opposite of chewy. they are sturdy as she said, but soft and tender and dense inside. I am still on the hunt, though, for a chewy PB cookie. they all seem to be either sandy or tender/soft. I like both those kinds, it is just that I am hunting for the kind we used to have in my school cafeteria in high school. they were very big and flat and cracked all over and CHEWY but fairly sturdy. How funny. It will be interesting to see what happens with the recipe since they’ve re-done the product. I think they did away with the syrup packets. I’m not sure, but I’ve noticed my store sells “whole grain” dunkables and there aren’t any syrup packets. The coupon supplement to yesterday’s newspaper had Pillsbury bake-off recipes, including yours! It was neat that I sort of know you through your blog. are these nice and chewy? The chunks I’m seeing are from chunky pb, correct? Oh I love peanut butter cookies!